Thinking of tackling too and bottom a-arm rebuild. This will be my first time. My question is do I go for a pre packaged complete set or collect piece by piece? 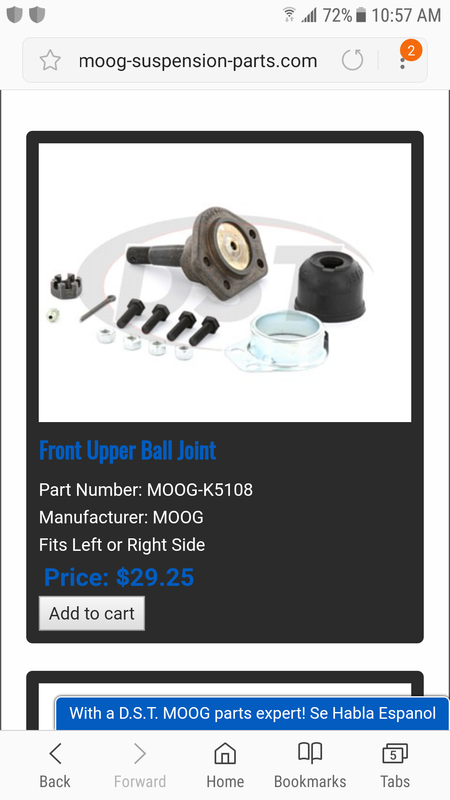 It's insane that 2 moog ball joints can cost nearly as much as a whole rebuild kit. Most "kits" are cheesey China made garbage . NOS GM made parts are the best , when you are lucky enough to find them . Old USA made , aftermarket parts are next best . Moog parts come after that . And are acceptable . I see what you mean , I did a quick search on E-Bay for a Moog K5073 balljoint . Which is the lower joint for a '65 Jetstar . Prices ranged from $143.94 (Summit Racing) down to $74.99 (West Coast Parts ) . For the same Moog K5073 ball joint ! On my '63 Dynamic 88 I had several years to gather parts . I shopped E-Bay daily and found all NOS or NORS parts for the front end . And I paid less than I would have from the K***** company . Go read my response to your other thread. If you think the Moog lower ball joints are expensive, wait until you try to find the correct, out of production, UPPER ball joints. Im not sold on moog yet either. Is there an alternate US manufacturer half the cost? I feel like moog is overhyped due to warranties that rarely get used. I'd rather pay half the cost if the replacement timeframe is the same and not deal with warranties. Sure. Half the cost, half the quality. I've previously cheaped out and had to re-replace ball joints after a couple of years. I don't do that any more. The ebay upper is a smoking price. Note that the uppers are different RH/LH due to the bolt pattern. SOB!!! I just logged in to ask if left/right was different part numbers and you already answered. Thanks Joe. 65 cutlass calls for same part number right and left? I am working on a 1965 jetstar 1. I know it's not a cutlass but find it odd that the delta or jetstar would have right/left specific upper ball joints but the cutlass does not? That's the way it is . Also note that the Jetstar joints fit only Olds . Not any other GM make. The Cutlass joints will fit Chevy , Pontiac , and Buick . Thank you. Is the 98, Delta, jetstar, the same front end parts for 65? Finding the right parts is harder than the labor. All 1965-70 Olds full size cars use the same front suspension. Yes, they are not the same as A-body. These cars are not popular to restore, so the market for these parts is small, thus the limited sources and high prices. None of these parts fit anything other than an Olds , except the lower control arm bushings , which are shared with Chevy . The control arm bushings and ball joints are the same on all 65 Olds except F-85 (Cutlass) . That's because other than the F-85s, Olds only built full size cars (Eighty Eights and Ninety Eights) in 1965. From 1966-1972, the only car lines were F-85, Full Size, and Toros. JOE. I found an old post from a couple years ago where you referenced a complete front end rebuild kit from Kanter. Was this one of your trial and error experiences on your way to only using Moog? Thoughts on TRW? That post is likely from before the time I got my 67. I have used Kanter for suspension parts for my 62 and was less than impressed. Moog, TRW, McQuay Norris are all quality brands. Only Moog is currently making parts for these cars. The TRW and McQuay Norris replacement parts do show up as new old stock. FYI, the "T" in TRW is Thompson, which made OEM parts for Olds for these cars. You'll note that the center link, pitman arm, and idler arm can be either Saginaw or Thompson, and the diameter of the tapered stud is different between the two. TRW stands for Thompson-Ramo-Woolridge. Thompson was the car guy, Ramo and Woolridge were the space guys. Combines my hobby and my job. I interviewed with TRW in Redondo Beach when I graduated college. I seriously considered going to work for them because there was a parts counter in the building where you could get employee pricing on TRW car parts! They even had the parts store paper catalog on the counter. Always best to simply call me -- Craig -- 516 - 485 - 1935.... West Hempstead, New York..
you can "swing it, monetarily" during this wintertime, I would. be able to give you your maximum discount, while things are slow..
You're not buried under a tremendous snow bank somewhere, are you???? Quick Reply: Ball joints, a-arm bushings.